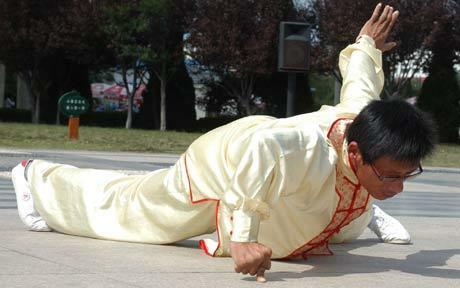 Fu Bingli is a gung fu master who has been training since the age of seven. In October of last year, he set the Guiness world record for most consecutive one finger one-handed push-ups. He also claims he can perform the one finger assisted handstand, but this is unverified. I wouldn't doubt it though after he completed 12 push-ups on just one hand on just one finger! He says, "...my index finger has as much strength in it as most people's entire body." There may be another Hai-tank after all.